In marked contrast to its rather inconspicuous appearance, this species has an elaborate and salient song, which is often extolled as one of the most beautiful of bird songs. Named by John James Audubon after John Kirk Townsend, the first person to collect a specimen, this is a bird of western North America. They normally range from the Pacific coast to the Continental Divide, where they breed high in the mountains up to and even above the tree line, and forage for insects. In winter they move down into the canyon areas of the lower elevations, spreading outward from the mountains into adjacent foothills and valleys. In their normal western range they feed exclusively on juniper berries during the winter months. Most populations appear to make only a short altitudinal migration between summer and winter grounds, although more northern breeders migrate longer distances southward for the winter. During the winter, individual birds of both sexes are strongly territorial, defending patches of juniper trees. Individuals engage in violent fights to establish and defend high-quality feeding territories. 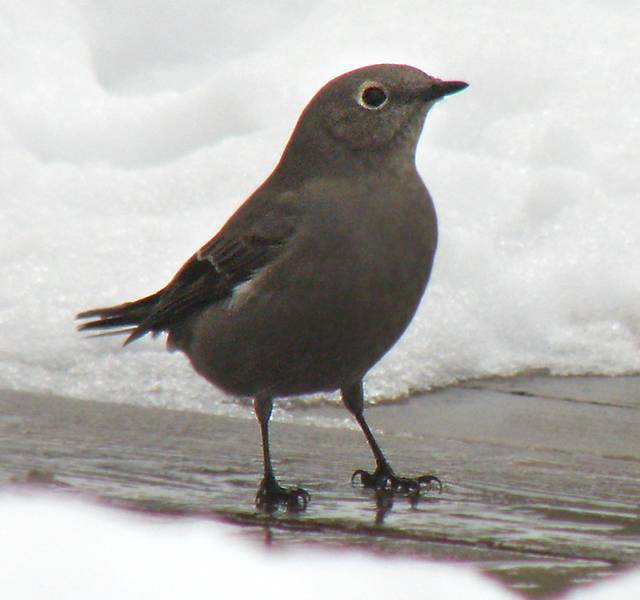 This may be part of the reason that, every winter, a small number of Townsend's Solitaires abandon their normal range in the Rocky Mountains and make appearances in Ontario and other eastern locales, occasionally making it as far as New Brunswick and the New England states. Winter distribution also seems greatly influenced by berry abundance, causing them to travel farther in years of poor juniper berry crops. The first collected Ontario specimen was taken in March of 1962 from Point Pelee, though there were several previous unpublished sight records. Toronto and Hamilton record most of these rare visitors to this province. Although the normal winter diet of this species is juniper berries, when in Ontario, many seem to make do with buckthorn nutlets. December 13, 2009. One observed and photographed at the Haileybury marina by Serge Gendron, David Gendron and Michael Werner.